Spam and comments are not the same. And since the presence of spam undermines comments, spammers are obviously rubbish at proper blog commenting. Their contributions are instantly treated as a nuisance and are deleted accordingly. You’d think they would realise and give up. But no, we continue to be bombarded with them. So apart from running the risk of teaching spammers how to comment properly, but I am also letting you know why they are rubbish in the first place. And here’s some code you could paste into your own posts (via the text mode) if you want to share this Infographic with your readers. If you get a comment that is extremely smarmy, and consists of ingratiating praise about your post, don’t be swayed by this flattery. It is spam. Spammers do this because they want to get their comments published. They think that by being extra nice you will be pleased at receiving such a response. And with newbie bloggers who are happy to receive any comment, they succeed. However, fawning over the blogger and calling them “my dear” is thoroughly nauseating. It’s good to mention the blogger’s name in the first sentence, but any more than that is spamming. Over familiarity is definitely not proper blog commenting. If you get a comment that fails to refer to the post’s subject in any shape or form, it is spam. This is because spammers aren’t interested in what you have written. In fact anyone who doesn’t bother to properly read the post and understand its message, could be construed as spamming. It is only a common courtesy to read the post in question before commenting, so that you can provide a reasoned and appropriate response. Certainly acknowledging the point made is proper blog commenting, but unnecessary congratulating on the post’s quality without mentioning the subject is something spammers do to flatter you. Another praise tactic used by spammers is complimenting the blog’s author about their vast knowledge on the post’s subject. You may think this is being nice, but it’s another form of flattery. If you see a phrase saying they are extremely impressed by the information this post contains, and that they have bookmarked the post and shared it with their friends, this is spam. Avoid being won over by this, it is just spammer’s flannel. You can easily acknowledge the post’s content by continuing the argument or adding extra valuable information of your own. Spammers know nothing interesting about the subject, so all they can do is compliment, which is not proper blog commenting. Spammers aren’t interested in the post’s subject, their intent is to get their comment published, so that they can either promote their own product or the links the comment provides can go live. They will also continue spewing forth drivel to make up the necessary amount of words to get past the moderation systems. Nothing of what they say is relevant to the post. Proper blog commenting will keep to the point of the post, and make sure any feedback is as relevant as possible. Going off topic can be construed as spam, so focus on producing a meaningful contribution. Spammers won’t be commenting only on your post. They will have thousands to get through, so their purpose is to dump their contribution and leave as soon as possible to the next blog, never to return. Proper blog commenting offers valuable information that can help other readers to continue the quality of the post. Offer relevant suggestions or advice that could make a difference to other readers, at the same time being mindful of the blog’s author and what they have said. Spammers have no intention of extending the value of the original post. Their content will have nothing in it that could spark a discussion, enhance the subject or encourage others to comment as well. It will be merely an empty vessel containing no importance. Inexperienced commenters can sometimes be mistaken for spammers if they don’t write enough in their comments. Proper blog commenting requires a bit more content than just ‘Nice post’ or something similar. Spammers have no intention of extending what they can say above the bare minimum. They have no information to hand that could be used as an example or even share personal experiences that relate to the post’s subject. However, avoid writing reams in your comment. This opportunity should be used to provide a concise and well-written contribution that outlines your point of view. Writing too much can also undermine the original post and its author. You’ll never find any spammer disagreeing with the post. It’s not in their best interests, as they want to get their comment published, and negative comments could be ignored and deleted. However, proper blog commenting should not shy away from voicing an opinion. If any facts needs correcting, or you have a valid argument that is in opposition to the post’s subject, by all means share this within your contribution. To get your comment accepted, any contradictory post will fare better if they have suitable justification and facts to back up your argument. Any author will value well reasoned feedback if it is constructive and forthcoming. Spammers attempt to show respect to the blog’s authors. However, this tends to come across as ingratiating drivel that balks up the comment with irrelevant content. However, proper blog commenting shows respect by acknowledging to the blog’s owner that their post has been read thoroughly, and therefore totally understood and appreciated. The resulting feedback uses suitable language that isn’t insulting or undermining to anyone who reads the blog. Politely expressing your point of view will culminate in a flurry of responses that enhances the conversation and adds value to the other readers’ enjoyment of the post. The only thing spammers are passionate about is getting their comment published so they can fulfil their dastardly deeds in unsuspecting blogs. Whereas readers who are experts at proper blog commenting enthusiastically express the reason why they felt compelled to respond. Commenting can be an impromptu occasion, and passion can play a real part in this. Use emotion-fuelled language to engage and capture the attention of other readers. This rhetoric and persuasive word association will encourage a better response to bring the audience around to their point of view. There won’t be many spammers who could match up to this. A usual indicator for a spammer is their inability to write well. And contributions that have obviously been through a web translation application stick out like sore thumbs, due to the peculiar results that occur. Spammers are notorious for offering strangely written comments. It’s almost though they can’t be bothered to edit the contributions before submitting. If you can’t read it properly, treat is as spam, or if you’re feeling kind, put it into the ‘bin’. If you are going to accept proper blog commenting, it should be written in understandable English. A comment needs to contain adequate spelling, good grammar and sensible sentence syntax so that it reads well. Anything below par is unlikely to pass through the moderation systems..
Spammers are too busy spamming to follow through with their comments. All they are interested in is dumping as many spam-ridden comments as possible. This means their contributions are not written to induce a response from other readers. Whereas proper blog commenting uses language designed to initiate a response either from the blog’s author, or from other readers and commenters. This phenomenon is enhanced by resulting in vibrant discussions and conversations, which makes the blog appear popular. This in turn attracts the attention of the search engines, which are designed to notice blogs with lots of comments. To obtain high numbers of delivering spam, spammers resort to copying and pasting the same comment everywhere. This particularly reveals the irrelevance of comments on unsuitable blogs. This duplication can be dangerous, as it is heavily penalised by the search engines. The lack of individuality and relevance undermines blogs that accept these comments. If you want to check whether a comment is spam, Google it to see if it appears anywhere else. Proper blog commenting always delivers real and bespoke contributions every time, carefully tailored to fit with the blog’s subject and suitable for its readers. After all, the blog’s author deserves nothing less. So how good are you at proper blog commenting? 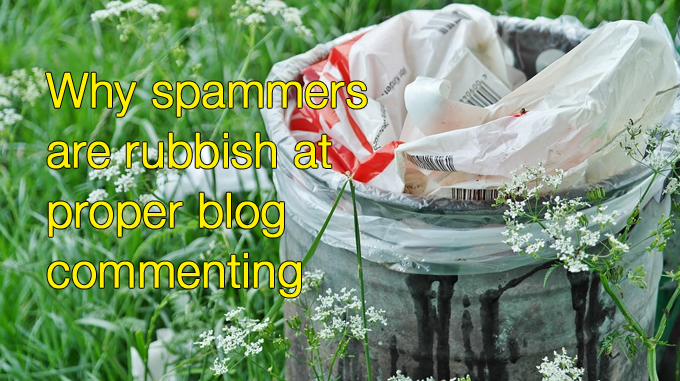 It’s worth noting the characteristics of spamming so to not fall into the same trap. Suitable effort is needed each time a comment is written and submitted. And definitely time is needed to properly think about what you are going to say. It’s extremely important to know how to write a good comment, one that will acceptably pass the moderation systems and suitably enhance the post it is referring to. Proper blog commenting is a dying art, with the rise of real-time communication on social media. This quick-fire commenting is becoming more like spam. Avoid going down that route if you want to be successful in leaving comments on blogs. Show me how proficient you are at proper blog commenting by leaving one in the comment box below, telling me what you think of this post. I shall be delighted to receive it! Are you lucky enough to know who your loyal commenters are? I like to Google comments in the moderation queue if they look suspect. If I see the same comment appearing on many other sites, it gets sent to the Spam. Good idea Claire, it’s always best to check these things. Love the infographic, Alice. I’m always amazed at spam comments, how do they think they will fool anyone, but obviously they do and I’ve been taken in in the past. Every now and then, I’ll read some, especially when the comments are so unrelated to the post topic and sometimes they are so bad they’re hilarious . I know, Cathy, some of them are truly terrible. You’d think the spammers would realise their comments are dreadful, but perhaps they’re not very bright and think everybody else is as thick as they are. The spammers, ugh. So frustrating and easy to spot which makes me wonder whether they have any success. Clearly they do otherwise they wouldn’t bother. Thanks Sherry, and yes, I know what you mean. The obvious ones are so easy to spot. But you’ve still got to be on the lookout for spam that is more clever and sneaky, and not get fooled by it. Every day I have to delete a lot of spam messages, I do not know how to block, I am looking for a plugin to be able to do blocking.